Adding style and convenience to any outdoor setting, the Teak Picnic Table (Round) is the start to any party, picnic or relaxed dining experience. 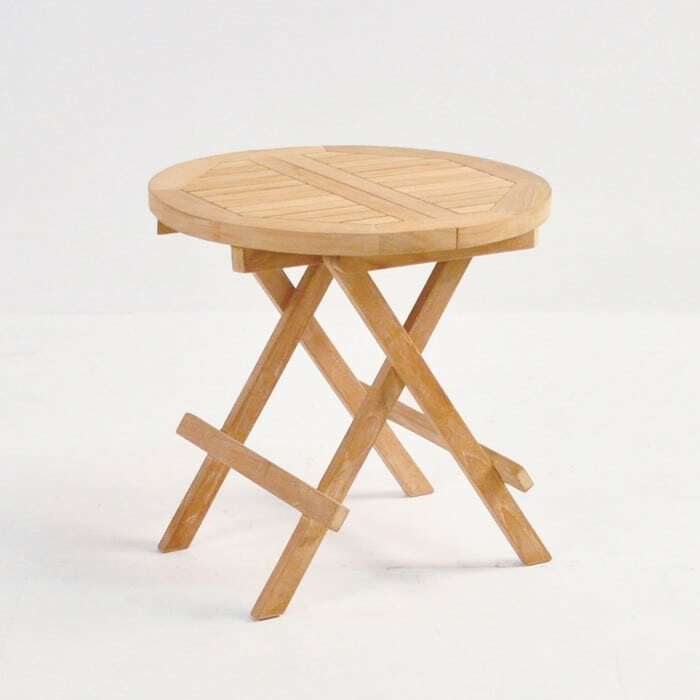 This charming round table is a formidable choice when it comes to brilliant and flexible side tables, because the Teak Picnic Table (Round) features a wonderful folding design, enabling the beautiful table top to unclip and fold into a unique bag design, perfect for walks to intimate, enclosed beaches or to tuck away for splendid storage. 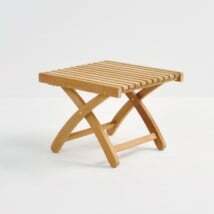 The Teak Picnic Table (Round) is made out of 100% A-Grade Teak, the best kind of wood for outdoor use! W20" x L20" x H19"
A-Grade Teak is a favorite material for outdoor use, because it is stunning, durable and long lasting. Sourced from plantations in Indonesia, A-Grade is lush with natural rubber and oil. We know that this is a material that will stand the test of time, and is extremely easy to maintain! Whether you keep your Teak Picnic Table (Round) honey color or let it weather to the pretty silvery-gray, all you need to do is clean your teak a few times a year to keep dirt out of the grooves, and ensure that your teak looks beautiful year round. Teak Warehouse is proud to carry teak in A-Grade and Reclaimed varieties, as well as a multitude of high end, marine quality furniture. Explore our website, or call our showroom! Our sales consultants are happy to help you find the best look for your home! Choose from Aluminium and #316 Stainless Steel, Sunbrella® fabric and Batyline® and Textilene® mesh, Raw Concrete, Resin, three glorious brands of All Weather Wicker – the options are endless! Whether you are wanting to create a modest dining set – with the Teak Picnic Table (Round) – or grand setting involving deep seating, or a fabulous bar area, poolside glamour, we are confident we can help you find a look that suits the dimensions and character of your space as well fulfilling your needs and desires! Our sales assistants are on hand 7 days a week to help you discover a new suite for your great outdoors! 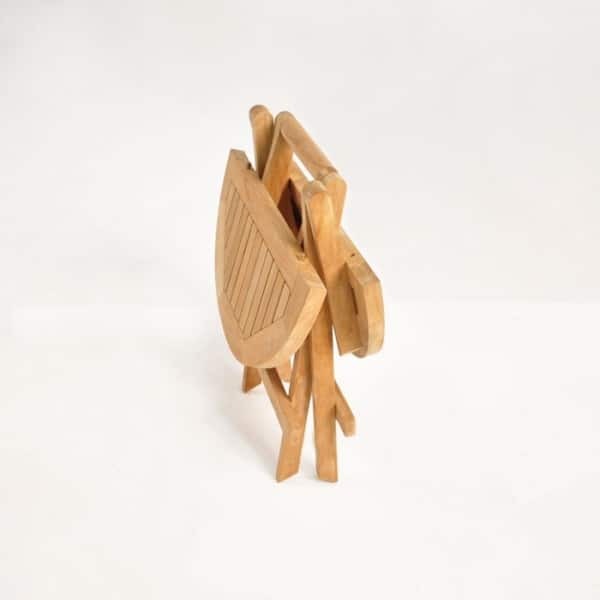 Keep one of the Teak Picnic Tables (Round) in the trunk of your car with a couple of teak folding chairs for instant, impromptu and easy beach picnics! How about a Teak Picnic Table (Round) on your patio with two wicker relaxing chairs for a perfect afternoon spot for a glass of wine and chat with your favorite person. How about the Teak Picnic Table (Round) next to your Teak Deep Seating for an excellent accent table that takes away the necessity for a coffee table if you have limited space. 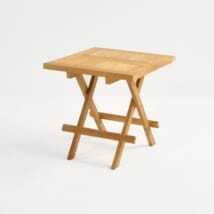 We love the Teak Picnic Table (Round) for indoors or out. Use as an extra serving area inside, or as a convenient table for the bathroom! Whatever you choose, we think the Teak Picnic Table (Round) is a brilliant choice for any home! Call us now to order yours!